Who doesn't LOVE the holiday season? One of my favorite activities this time of year is wrapping gifts! In high school I used to volunteer for charities during the holidays and wrap presents at the local mall. The selection of decor was typically limited to basic (boring) paper and curly ribbon - but it can be so much more with just a little extra effort! This isn't a blog post about how to wrap a present (there are plenty of how-tos on that already). But how I styled my gift wrap this year with minimal effort and minimal cost. The standard gift wrap consists of  wrapping paper and  ribbon. This year, I went with a neutral and white polka dot wrapping paper with red and white ribbon. I wasn't quite satisfied with this choice, feeling that it could use a more festive touch. I roamed around my local Target aimlessly and eventually stumbled upon faux leaf garland in the crafts aisle for $3.99! It's not rocket science but I wrapped the presents normally and slipped in a piece or two the garland before tying the bow knot. I gave the garland a twist here and there for some shape. The touch of green is the perfect accessory! In total, I was able to wrap all my gifts (about 8 items of various sizes) for under $15 which includes 1 roll of wrapping paper, 2 ribbon options, scotch tape, and the faux leaf garland. There was plenty of wrapping paper left over. I always look forward to gifting friends and family, but I'm in an extra festive mood now. 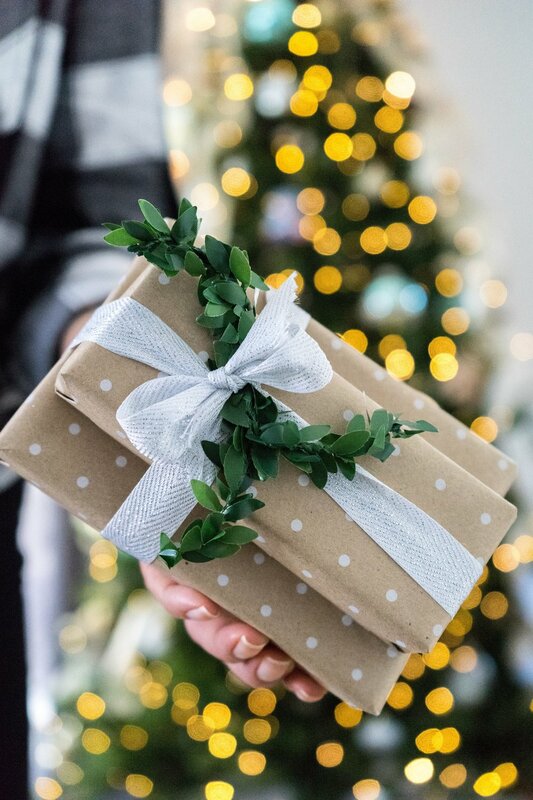 PRO TIP - TJMaxx, Marshalls, and Homegoods are the best option for gift wrap! You can get rolls of quality wrapping paper for $3/each and spools of ribbon (~10 yds) for $5/each. Merry Christmas everyone! Happy Holidays! I hope that you have a joyful and healthy holiday with your family and friends.